I've learnt the cost of the mayor's flagship cable car project has gone up - again. Initially, Transport for London (TfL) estimated the cost at £25m and said it would use only private finance to pay for it. Then the estimate increased to £45m, with TfL admitting it would use its own budget. Now, we find out that figure did not take into account "technical and legal advice, project management and assurance, land acquisition and procurement costs". TfL says the total cost will now be £60m and it is actually paying for it out of the rail budget. 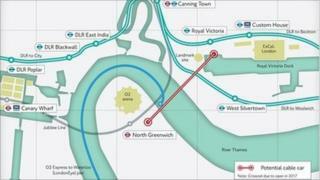 This is what TfL sent to me: "TfL is forecasting to spend approximately £60m on the build cost for the cable car. "This includes the £45.1m for Mace [the construction company] build, £9.3m for other build costs. "In addition an allowance of £5.2m has been set aside as, with any project of this scope and scale, funding for a contingency (set at 15% of the contract value) is required to cover unforeseen costs, although this may not be used. "TfL is seeking to recoup the build cost through a combination of sources including a commercial sponsorship, third party funding (via an application to the European Regional Development Fund) and fare revenue." TfL is in discussions with a potential sponsor and hopes to make an announcement soon. Once finished, the cable cars will run 50m (164ft) above the Thames, carrying up to 2,500 people an hour between two Olympic venues: the O2 arena in North Greenwich and the Excel exhibition centre at the Royal Victoria Dock.